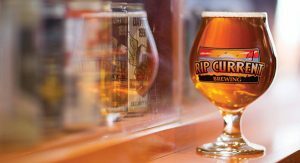 It is difficult to believe that more than 6 years ago the dream of two avid home brewers became true with the opening of Rip Current Brewing Company. Since 2012, we have explored beer styles from around the world while never loosing our focus on rad hoppy beers rooted in San Diego traditions. On Saturday February 2nd, we wish to thank all of our loyal patrons with our Anniversary Celebration event at both locations. This celebration recognizes both our 6th anniversary of brewing beer in San Marcos and our 4th year serving those brews in North Park! This year we are opening the barrel-aged beer archive to bring back many of your favorites from the past while also welcoming several new additions to the family. When our doors open on Feb 3rd, we will be releasing a limited number of 3 new beers in bottle or cans plus pouring them on tap. First, Barrel-Aged Down the Line Barleywine will be available in 500ml bottles. We aged this beer for 28 months to extract the amazing oak character from our first use Woodford Reserve bourbon barrels. The resulting 14.2% ABV English-style Barleywine offers a silky smooth balance of the complex oak flavors, residual bourbon and the underlying base beer. Second, we are releasing 375ml bottles of our second barrel fermented and aged sour called Mango Blonde Sour. This blonde beer matured in barrels for over a year allowing the mix of Brettanomyces, Lactobacillis and Pediococcus that impart a somewhat funky and complex sour aromas and flavors. We finished the sour elixir by adding fresh Mango puree to round out your drinking experience. Finally for you hop heads, we are releasing Lupulin Hazed Hazy Double IPA in 12oz 6-packs. Lupulin Hazed is the delicious result of our following the New England approach to brewing hazy IPAs using the hop profile of our flagship beer Lupulin Lust. At 9% ABV, this beer packs a punch but with very little noticeable alcohol and bitterness that might take away from the juicy citrus fruity aromas and flavors. No advanced ticket purchases are necessary. We will be open for regular business, but event goers will also be offered the option to purchase a special discounted package which includes 4 8oz barrel-aged tasters (or standard pints), raffle tickets and discounts on other brewery items (growlers, beer, glassware). Both locations will be tapping a great selection of our vintage barrel-aged beers as a delicious backdrop to the release of our newest creations – Barrel-aged Reserve Cuvee Blend #1 and Sour Series: Peach Blonde Sour! Both of these new releases will be available to-go in bottles for the first time at retail. The Reserve Cuvee was pre-sold on-line and sold out within the first day, but we have a few cases remaining that will go on sale when we open the doors, so don’t wait or you will miss out on these great beers. Reserve Cuvee Blend #1 features a complex palate of flavors imparted by the four barrel-aged components included in the blend. 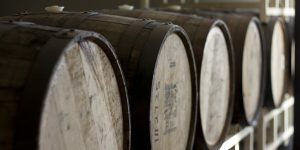 Every one of the component beers spent at least 18 months in fresh bourbon barrels! 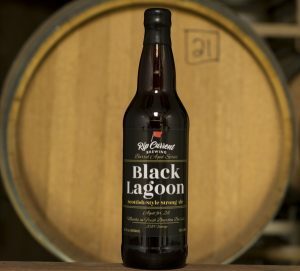 First, we used the bourbon barrel-aged version of our GABF medal-winning Black Lagoon Scottish Strong. This scotch ale provides the silky smooth foundation and contributes flavors of dark caramel, figs, oak tannins, and bourbon character. Next, we added 3 unreleased barrel aged beers to build out the flavor framework. 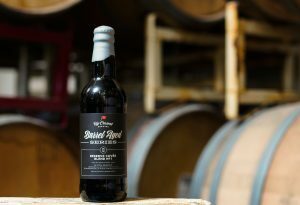 Barrel-aged End of the World Double Imperial Stout was added to contribute coffee, dates, toffee, and molasses character along with a deeper bourbon richness. Barrel-aged Buckwheat Old Ale adds a complex dark honey and buckwheat flavor and sublime oak tannins. Finally, Barrel-aged Wakeboarding Wheatwine imparts a rich toasty malt flavor and a full body with some bourbon spiciness. The resulting cuvee blend has a very broad array of flavors challenging your senses with every sip while finishing with a mellow warming from its 14% ABV as it goes down. Our Peach Sour is the first in our wine barrel-aged, multi-culture (wild yeast and bacteria) fermented sour beers to come out of our Sour Series. In early 2017, we brewed a blonde ale that went into a large number of wine barrels with a varying mix of inoculants (fermenting organisms). Our first release roughly 18 months later incorporates peach puree. The resulting 7.4% ABV sour has a fresh peach aroma and flavor with complex lactic/acidic sourness and hints of funk from the brett yeast. This sour is well balanced in part by using a restrained amount of fruits, so the fruit would not cover up the hard work done by the bacteria and wild yeast over the last 18 months. The North Park location is able to also pour guest beers, so you can expect to see some amazing barrel-aged beers from our colleagues at other breweries around town. On Friday, November 9th, both tasting rooms will be selling the remaining (after the brief on-line bottle pre-sale) 500ml bottles of Bourbon Barrel-aged Reserve Cuvee Blend #1 for $18 (plus tax and crv). We don’t expect the remaining bottles to last long, so be sure to arrive early to taste it on tap and buy your share. 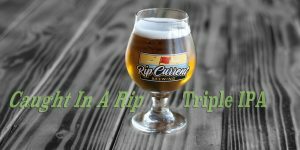 This is our yearly release of Caught in a Rip (CIAR) Triple IPA! This year we decided to go one step farther and release CIAR’s brother Caught in a Haze (CIAH) Hazy Triple IPA. Both CIAR and CIAH will be available in 12oz cans as well as on tap! Six-packs of either triple IPA are $15.99 (plus tax and crv). Both Triple IPAs weigh in at 11.5% ABV and have a huge hop aroma and flavor. We repeatedly add our favorite hops (e.g. Nelson, Galaxy, Citra, Mosaic, Simcoe, …) to make the resulting beers have a massive citrus, tropical and stone fruit and background pine-like aroma and flavor. CIAR is our West Coast-style monster Triple IPA that is blonde in color with noticeable hop haze and finishes crisp and dry with a significant bitterness on the finish to balance the alcohol sweetness. CIAH is a New England-style Juicy Triple IPA that is hazy blonde in appearance and is more-full bodied with a juicy fruity profile then its brother CIAR. CIAH is low in bitterness to allow the fruity sweetness to shine through. We have always been big fans of a well made barrel-aged sour beer, so in early 2017 we decided to allocate separate space in the brewery to start up our sour program. Like our barrel-aged clean (non-sour) program, these beer require significant time typically between 8-12+ months to develop and mature in the barrel before they are ideal to release. We purchased a large number of wine barrels and inoculated (adding of fermenting organisms) each barrel with varying proportions of wild yeast (brett) and bacteria (pedio and lacto) to achieve a complex blend of different acids causing sourness and complementary funk/barnyard/horse blanket (yes, this is how judges describe the flavors) from the brett. After a long wait, it is time to finalize each sour beer, so we taste and blend the barrels that have our target flavor profiles and add any final ingredients. In this case, we added peach puree and then wait again for the beer to mature. Finally, we bottle and keg the beer and again wait for it to naturally carbonate. After a long wait, we are stoked to announce the launch of our Sour Series and its first constituent Peach Blonde Sour! The resulting 7.4% ABV sour has a fresh peach aroma and flavor backed by complex lactic/acidic sourness melded with subtle notes of funk from the brett yeast. This sour is well balanced with all the flavors present by not adding excessive amounts of fruit that could cover up the hard work done by the bacteria and wild yeast over the last 18 months. On Monday, November 5th our North Park location will have the initial pouring and this will be followed on Thursday, November 8th with the second tapping of the Peach Sour in San Marcos. Finally on Friday, November 9th, we will release 375ml bottles of Peach Blonde Sour for purchase for $14 (plus tax and crv). This is a small batch release, so we expect it to sell out quickly. Get your tasty piece of Rip Current history and while your here also pickup some bottles of Bourbon Barrel-aged Reserve Cuvee Blend #1! On Wednesday, November 7th, we will be releasing our latest hazy IPA in our line-up, Murky Malarkey. It uses the super-popular hops – Idaho 7, Mosaic and Citra to create juicy citrus and stone fruit aromas and flavors while imparting very low bitterness. 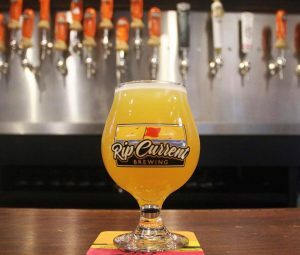 Unlike our previous hazy IPAs, this beer uses a special hybrid yeast that imparts a tropical fruity (pineapple-like) flavor to the beer to complement the orange, tangerine and apricot from the hops. Be one of the first to try this new hazy and let us know which hazy is your favorite. 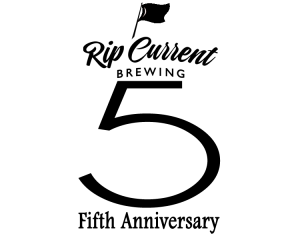 After a Friday night celebrating hops with the release of our Triple IPAs, we thought it was appropriate to pay homage to those who prefer the dark. So on November 3rd, we are kicking off our night to celebrate malt in one of our biggest malt-forward beers… Rescue Buoy Imperial Stout. First, we have taken our award-winning Rescue Buoy and infused cold-steeped coffee from Ironsmith Coffee Roasters. Then we decided to use Coffee Rescue Buoy as the base used to integrate a number of unique and tasty flavors for each variation. These variations are small batch beers, so don’t expect to see them after beer week. We hope you will join us with this celebration of all that is dark and malty! If you are a hop-head, have no fear their will be something on tap for you as well. We are continuing this very popular event from previous beer weeks, however this year we are highlighting Sour Night with the release of our first ever barrel-aged multi-culture (yeast and bacteria) sour with peaches! Our Peach Blonde Sour will be introduced on tap for the first time as a prelude to its bottle release on November 9th. For Sour Night in North Park, we are able to carry guest beers, so you can look forward to seeing some fantastic sour beers from our colleagues at: Council Brewing, Good Beer Co, Lost Abbey and New Belgium! 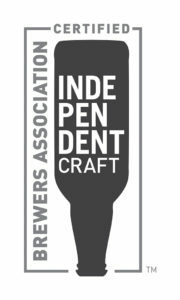 As you likely know, Friday November 2nd starts our yearly celebration of Small & Independent craft beer here in San Diego county. While some might say every week in San Diego is beer week, those of us in the brewers guild strive to make beer week extra special. With that in mind, here are our tasting room events. Unless noted otherwise, all events will be held at both locations. 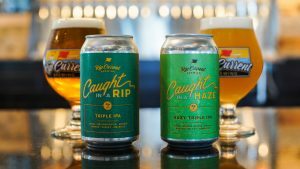 Can release for Caught in a Rip and Caught in a Haze 12oz can six-packs and on tap! Barrel-aged plus four special version of Coffee Rescue Buoy Imperial Stout will be on tap. We will be pouring Caught in a Haze Triple IPA and Raspberry Tart at Guild Fest downtown. First chance to try our new Peach Blonde Sour on tap! We also will have 3 special tart version and guest sours pouring. On tap release for our latest Hazy IPA using a new hybrid yeast plus Idaho 7, Mosaic, Citra hops! Very limited 4-course dinner pairing with Chef Caesar and our brewmaster Paul Sangster. Tickets available here on eventbrite. Choose the hoppy or non-hoppy flight and your sure to try some new release surprise beers. We will be releasing our new wine barrel-aged Peach Blonde Sour on tap along with several special variations of our Raspberry Tart. Prepare for a massive barrel-aged beer tap takeover coupled with a double special bottled beer release! The bottles won’t last, so plan to come early! This will be a huge tap takeover with our friends from Urge including many rare gems. We are releasing on tap our recent collaboration with Burgeon Beer Company, a Hopped on the Brutwagon Brut IPA! Another massive tap takeover with our friends from Obriens. Look for barrel-aged beers, hop monsters and something for you malty types. We will have a booth at Collabapaloosa and will be pouring our new Hopped on the Brutwagon Brut IPA collaboration with our buddies from Burgeon Beer Company! Beer and food pairing festival with top chefs from around San Diego. Look for something very hoppy from us! Summer Party … Hold This Date! Mark your calendars for a fun event coming up at Rip Current on July 28th! 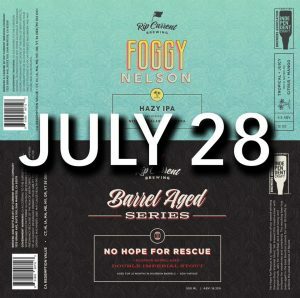 Not only will we have food and special beers making an appearance, but it is also your first chance to experience two special packaged beer releases! First, bourbon barrel-aged No Hope for Rescue Double Imperial Stout will be released in a new, smaller 500ml bottle.This crazy giant stout was aged in top shelf Heaven Hill bourbon barrels for 20 months allowing all the flavors of the Double Imperial Stout, oak and bourbon to meld harmoniously into a beer you won’t believe is 18.25%! After producing a series of very popular hazy IPAs for the last year, we have listened to your feedback and are making a limited amount available in cans! 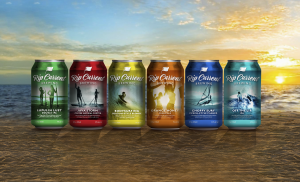 Yes, we will be periodically releasing 12oz cans of your favorite draft-only beers starting on July 28th. Our first release is Foggy Nelson hazy IPA. This “foggy” beer features the highly sought after Nelson hop from New Zealand that blasts your palate with juicy tropical fruit flavors. We hope to see you for an amazing summer bash and dual can/bottle release. Watch our social media feeds for more details over the next few weeks. 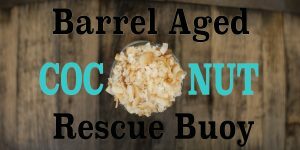 Coconut Barrel-aged Rescue Buoy Bottle Release! 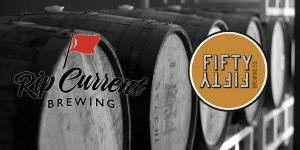 On November 6th, both Rip Current locations will release Coconut Barrel-aged Rescue Buoy Imperial Stout! At the start of each locations’ tasting room hours, we will be offering of this amazing small batch beer on tap and in bottles to-go! After 15 months slumbering in Heaven Hill and Woodford Reserve barrels, we introduced Bourbon Barrel-aged Rescue Buoy (BARB) in October. We aged a small amount of BARB on freshly toasted coconut chips and the results were amazing. Rather than just drink it ourselves, we decided to bottle some up and to have it on draft during beer week! That is right, you can try it on tap (while the keg lasts!) and then buy your bottles to go. 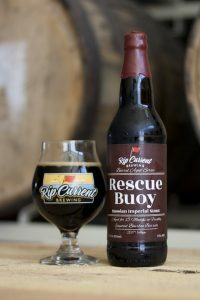 Rescue Buoy (the base beer) has received several medals in the Imperial Stout category including at the 2017 Los Angeles and San Diego fair international beer competitions! 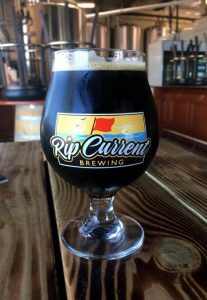 Coconut Barrel-aged Rescue Buoy leads with a burst of coconut followed by bourbon, molasses and chocolate aromas and flavors. The mid-palate satiates your palate with dark malt character including: dark chocolate, molasses, fig, dates and hints of coffee. The finish reminds you of the start with a return of coconut and bourbon hints of oak barrel tannins. This was a small batch, so we are not doing pre-sales. We have a very limited run of bottles that will be sold on a first come, first satisfied basis. We don’t expect they will last very long, so don’t wait. 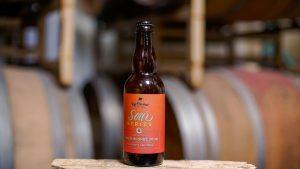 Barrel-aged Rescue Buoy Bottle Release! After 15 months slumbering in Heaven Hill and Woodford Reserve barrels, we are stoked to announce the release of Barrel-aged Rescue Buoy Imperial Stout in wax-dipped, 22oz bottles AND for sampling on tap starting Oct 20th! This year’s Rescue Buoy has received several medals in the Imperial Stout category including at the 2017 Los Angeles and San Diego fair international beer competitions! 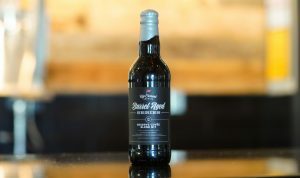 The bourbon barrel-aged Rescue Buoy has a silky smooth dark malt character featuring dark chocolate, molasses, dark fruits (prune, date, fig) and coffee, all surrounded by complex bourbon flavors and oak tannins with fleeting notes of vanillin. Come try this amazing beer while it lasts and take a few bottles home to enjoy with friends later.